February 1, 2019 January 10, 2019 / Elizabeth T.
Can you believe the first month of 2019 has already flown by? Time seems to be going by faster and faster! As with every month’s end, I’ve rounded up some of my favorites! 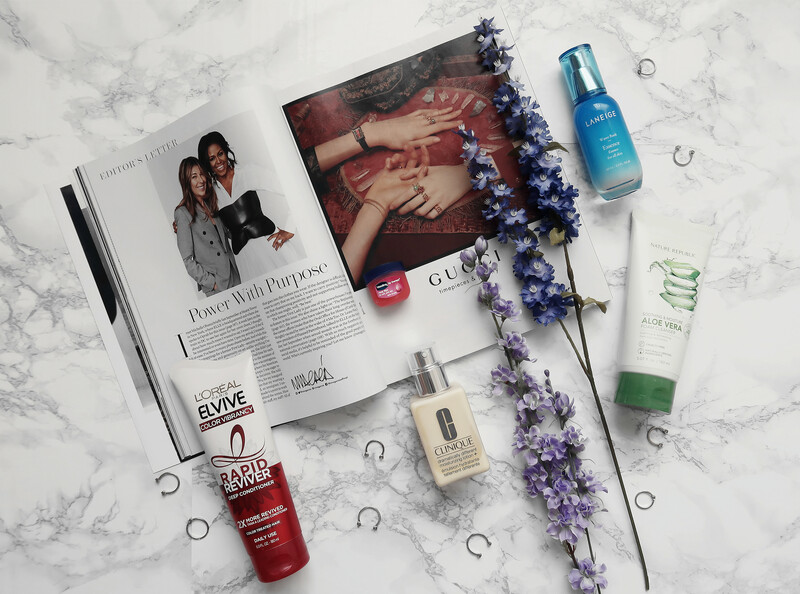 Read on to see what products made my list this month! First up is this Aloe Foaming Cleanser from Nature Republic. During the winter months, I tend to switch over to less harsh products, since the colder weather can irritate my skin and make it more sensitive than normal. If you’ve been following me for awhile now, then you’ll know that I’ve always been a big fan of the Innisfree Green Team Foaming Cleanser, which is super gentle yet effective. This winter, though, I wanted to try something even more soothing, so that’s why I decided to try this Aloe Foaming Cleanser! It’s super gentle on the skin, and I’ve found that my face doesn’t feel tight afterwards too. Plus, it’s super affordable, making it such a great skincare staple! A side note for those of you that are more sensitive to scented products – this does have a stronger scent than the Innisfree cleanser, but the fragrance is more of a light and fresh scent. If this bothers you, though, I’d recommend to try the Innisfree Green Tea Foaming Cleanser, since it’s lighter in scent. Other than a new face wash, I’ve also added a new essence into my skincare routine! In the past, I’ve always thought just using a serum is enough, but as I’m nearing my late twenties (OMG, so old! ), I’ve been actively trying to take better care of my skin. I didn’t want to overwhelm my skin, though, so I opted for this lightweight, moisturizing essence from Laneige, since I’ve seen such good results from their products in the past. I definitely wasn’t disappointed with this essence because it makes my skin look and feel so healthy and supple! After use, it makes my skin look younger by giving it a healthy glow, as if I drank gallons of water! Another plus – it looks great under my makeup and feels so lightweight, which means I can continue using this product into the warmer months as well! During the winter months, my skin tends to act out more than usual. Though it can get dry and flaky sometimes, I find that thicker creams can make my skin appear oily, but lighter moisturizers may not be moisturizing enough for the harsher weather conditions. Over the course of the past few years, I’ve been trying a lot of different face products, but I find myself turning back to Clinique time and time again because their products just work so well for my skin! I’ve heard so many great reviews about the Dramatically Different line, and during Sephora’s holiday sale, I picked up a bottle of this to try. Needless to say, I was pleasantly surprised by the results! On days when my skin is acting up, I want to give it something simple, and this unscented moisturizer from Clinique brings my skincare routine back to the basics and helps to calm it when it’s feeling dry yet irritated. I love that it’s lightweight, yet moisturizing, and the unscented formula really helps sooth my already sensitive skin. Another big plus – the packaging! While I love all of the pretty jars that I’ve collected throughout the years, the bottle and pump that this moisturizer comes in just screams hygienic! Also, this means the actual product isn’t consistently being exposed to the environment. So this next favorite might get some mixed feedback, but I’m a big advocate for Vaseline, especially for my super dry and chapped lips! I’ve been using Vaseline for my lips since I was in my early teen years, and it honestly makes such a difference! My lips always feel so soft after use, especially if I layer it on overnight. Though I’ve always just opted for clear petroleum jelly, I found this pretty rosy one at my local drugstore a little while ago when I was shopping for some travel essentials. I love how the rosy version of Vaseline is still as functional as the regular one, but at the same time, it adds such a nice and healthy glow to my lips! It’s also such a great lip product to use during the winter months because it offers maximum strength moisture, while still giving your look a perfect splash of natural color! And last, but definitely not least, is this deep conditioner from L’Oreal! I received this complimentary from Influenster and L’Oreal for testing purposes, but after the first two uses, I can confidently say that I will be adding this to my haircare routine! As some of you may know, I bleached my hair last year, and now I have balayage highlights. While the dying process didn’t really damage my hair too much, it still feels significantly drier and more brittle than my virgin hair, especially now that it’s colder. With this deep conditioner, though, my hair feels so silky and soft after use! I try to use it two times a week, and it’s helped my hair stay healthy and shiny! These all sound great! I’ve always wanted to try laneige products. Thanks for sharing them! Laneige is one of my favorite brands ❤ 🙂 All of their products are of such high quality! Great choices! Loved reading this post! Thanks girl ❤ 🙂 Glad you liked the post! I love this post! The photos are really beautiful! I love all the favorites you shared! I’m always the on the hunt for new items. I’m gonna have to look into that Aloe face wash asap! The aloe face wash is sooo gentle! I want to try the Nature Republic foaming cleanser!! I’ve tried their aqua gel before and really enjoyed it using for the summer time. Yes, I can’t believe time flies so fast! And yes, the Clinique products are my favorite! L’Oreal Elvive is one of my favorites! Yesss, I can’t believe it took me so long to get into it, but now that I’ve been using it, I can’t stop! I love reading favourites posts because it’s like raiding one’s beauty stash 😀 Out of all of these, I’m definitely going to try out the Clinique moisturiser. Hahaha totally agree with you! ❤ 🙂 And yes, that moisturizer has been a lifesaver this winter!